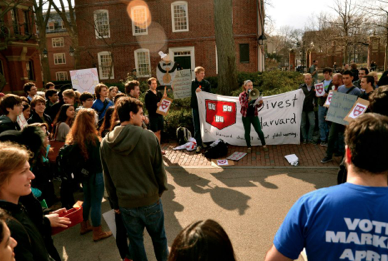 On April 11th, 2013, Divest Harvard held its first big rally outside Massachusetts Hall, which houses the Harvard administration’s offices. The rally featured speakers Hannah Borowsky (a sophomore and Divest Harvard member), Reverend Fred Small (of the First Parish in Cambridge), Tara Raghuveer (Undergraduate Council President), Professor David Keith (of the applied physics department), and Ben Franta (Divest Harvard member). Nearly 200 enthusiastic supporters presented 1,300 petition signatures to the Harvard administration.